Exclusive Books and the Graduate School of Business, University of Cape Town are delighted to announce the launch of a new series of intimate dialogues on today’s most important topics, The Bicycle Talks. 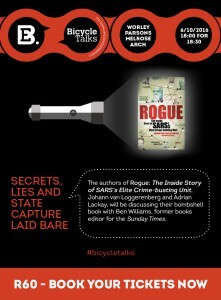 The inaugural Bicycle Talk will take place Thursday 06 October in Johannesburg, and see the authors of the bombshell new book, Rogue: The Inside Story of SARS’s Elite Crime-busting Unit, Johann van Loggerenberg and Adrian Lackay, in conversation with Ben Williams, former books editor for the Sunday Times. Congratulations on this initiative. What an apt name for such a riveting concept. May it grow to influential heights. I am not a Business leader, not an academic, so I guess I am a thinker. I will surely attend events in Cape Town.